A Twitter thread made me think about a ton of things I’ve been trying to reconcile for a while, which deserved a proper blog post while I sit at this San Franciscan coffee shop like a good little hipster nerd. Lol same. Hidden behind every great artist is 10,000 hours of sucking realllllllly bad at art. It’s the same as putting your passion for computers above and beyond your job. There’s a lot of truth to that. There are so many things I’ve been fascinated to try: jujitsu, fencing, open-source software development; but have been scared away at the thought of being judged. FreeBSD core contributor, podcaster, and author Allan Jude at AsiaBSDCon introduced me to Imposter Syndrome which definitely resonates. Even in projects or endeavours I’ve presented to the world, including this blog, I still feel like I’m faking it till I make it, when the real experts are out there experting. Maybe that’s the double-edged sword artists and developers share: unlike others, we can toil in expletive-filled privacy until we’re confident enough to show the world; but then breaking out of that shell becomes a struggle. 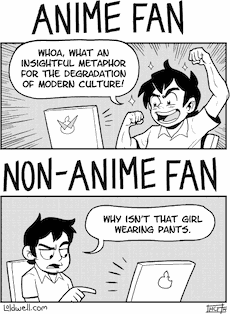 This applies to so many series, not least fan art. Gurren Lagann is widely considered one of the greats, but Yoko wears a bikini. My sister loved the comedy sci-fi Needless, but warned of “underwear everywhere!” on the part of the gents and ladies. Even a cultural revolution like Madoka Magica carries short skirt warnings by western reviewers — really. Anime has a very different set of norms given its foreign context, but also decades of accumulated in-jokes and references. It’s reasonable for someone outside this bubble to find it weird or objectionable, even if I can’t relate. (I was brought up to find people under physical duress with blood and gore far more objectionable, but western society prefers violence to wardrobe malfunctions. That’s fsck’ed, but also for another post). Thus, I gradually chickened out over the last decade here, and avoided sharing art and series I was watching. I’m sad about that in hindsight; I’d love to go back and see what I thought of certain things at the time. Do I keep self-censoring? Do I add a NSFW Read More link for posts that some might find questionable? Or do I get over the hangup entirely, and live with the potential shift of this site’s rating? I’m open to suggestions! [..] but partially also like, it feels like I’m not properly crediting or it undervalues their work or something. This deserves its own post. But in short, I completely agree, though it took me being in a long term relationship with an artist to make me appreciate it. It shouldn’t have had to.